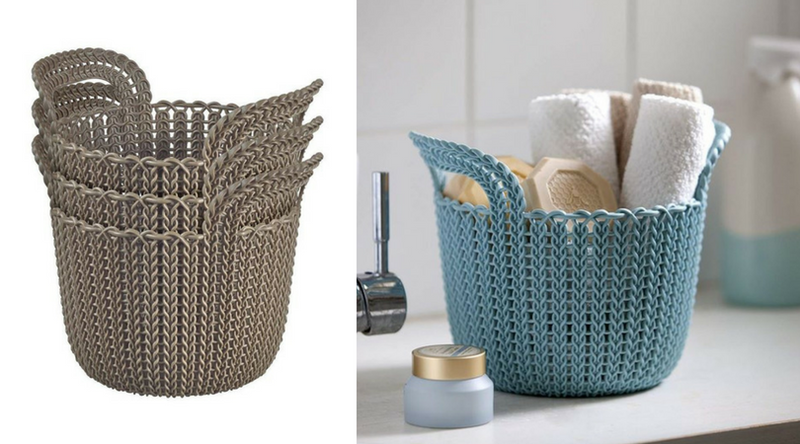 Cozy’s patented KNIT design constitutes stain-resistant polypropylene, artistically woven to resemble the elegant knitted patterns of yesteryear. Although the alluring design looks delicate, it’s a surprisingly robust with just enough give to provide comfy seating, hence the Cozy name. Elegantly styled, the Cozy set complements outside seating areas, sun-porches, conservatories, summerhouses, balconies and inside decors meanwhile their versatility pleasantly provides extra seating, footstool support, storage and table-top services. When you unpack delivery, the storage table’s positioned within the hollow pouffes making this Urban set ideal for small places. They attractively nest together in the corner of a room meanwhile feedback suggests the ottomans hollow design additionally tidies rooms to perfection, covering-up for items on the floor with aesthetic eye-appeal. I was born in the late 1960’s and vividly remember the patterns Grandma used to knit; along with her friends they formed a knitting bee and produced some wonderful creations. Roll on a generation, Mum & her friends had no interest in this time-consuming hobby, relinquishing the tradition of knitting to nostalgic memories. Watching the short video below demonstrates how Keter’s KNIT design was formed, taking the essence of Grandma’s knitted creations and simulating the effect in woven resin style, producing an elegantly crafted, flexible & weatherproof material, flaunting subtle tones. 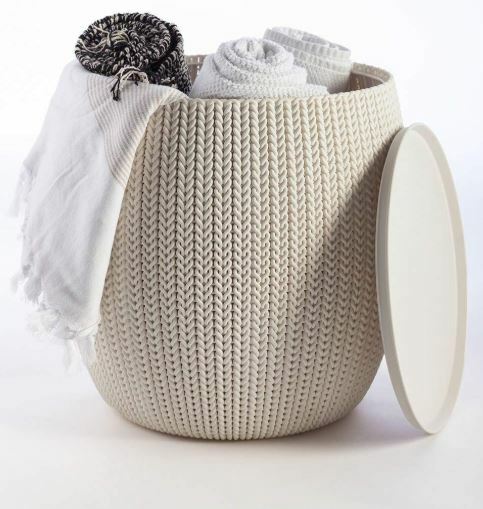 Constituting eco-friendly reusable & exceptionally durable polypropylene means the entire KNIT collection enables reforming the resin into alternative products after years of use, when the time comes to exchange. Combining UV inhibitors with the previously described colour tints stabilises the manufacture to combat sun-rays bleaching the pigments and the heat of sunburn blistering & splitting the manufacture. Keter products receive wondrous remarks through feedback, how their UV protection withstands the afflictions of sun radiation. 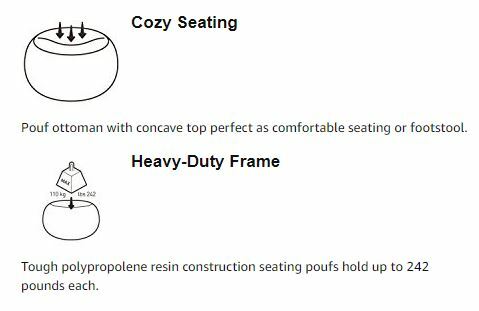 Polypropylene is not susceptible to decomposing nor corrosion regardless of stationing in damp conditions or driving rain; ever enduring makes this Cozy Urban Set ideal for using outdoors. Moreover, it’s swift to clean, a damp cloth with a squirt of household detergent or an occasional shower down with the hosepipe spruces up appearances lickety-split. Always refrain from using abrasive cleaners though, these may scratch the woven resin. 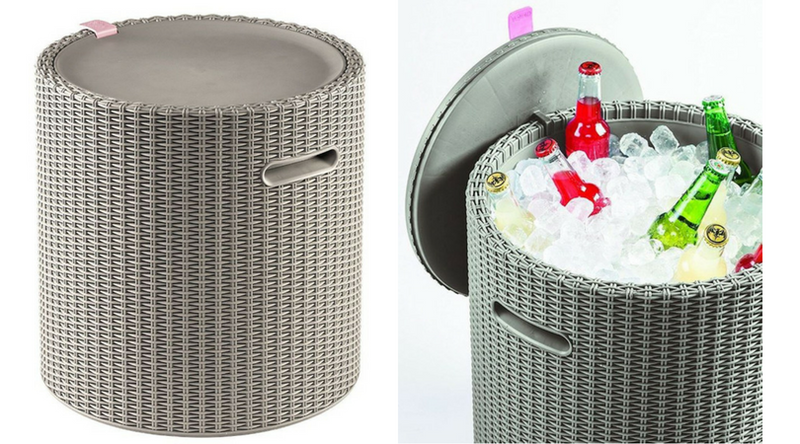 The storage table comprises a flat polypropylene lid, designed for placing drinks on top meanwhile caters to accommodate a wide range of indoor / outdoorsy accessories. Expressed through feedback, the storage compartment is weatherproofed up to a point, however, it can be subject to sideways rain seeping inside the lid’s lip therefore it’s best positioning in a sheltered zone if you’re storing delicate items and rain’s forecast. The resin is formed into slender strands portraying the style of wool meanwhile additional additives make the polypropylene flexible to enable intertwining the strands to attain yesteryear’s knitted patterns. Cutting-edge molding techniques produce the intricate woven character, simulating the effect in exquisite 3D style, beloved by all generations. 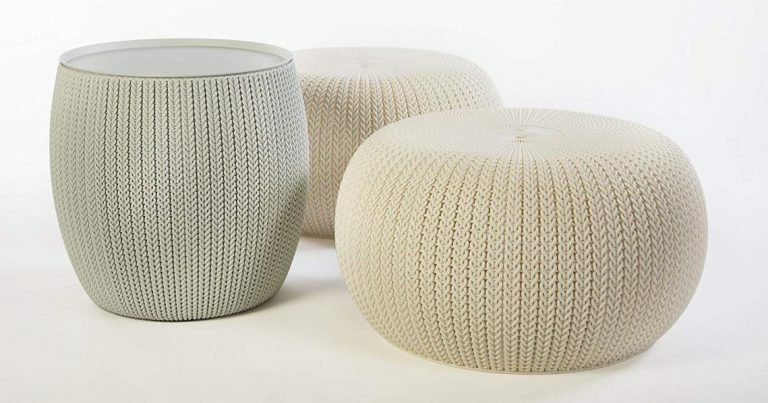 The ottomans / pouffes comprise a shallow concave top that gently slopes towards the centre therefore only the storage table is designed for placing drinks on top. 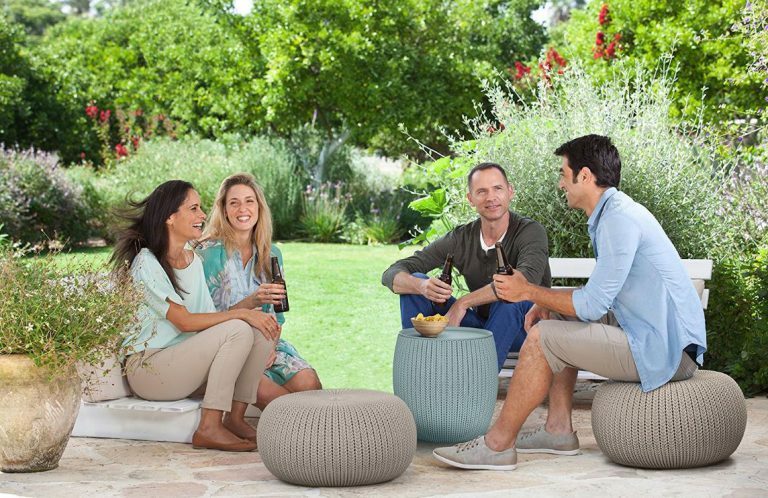 Couple the cosy shape with the very-slight stretch, the pouffes provide comfortable seating besides catering for footstool support, enabling to take the weight off your feet when lounging around, both indoors & outside. The twin ottomans are lightweight in design therefore can be easily moved, however their sturdiness holds a seating capacity up to 242 lbs which in my book equates to a tad over 17 stone. It’s surprising how robust braided polypropylene develops into. 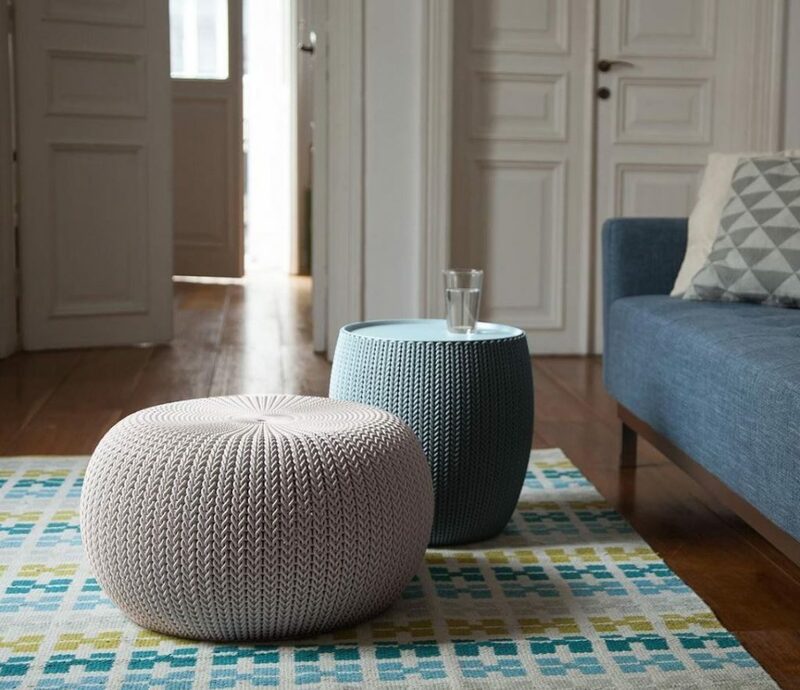 Each pouffe comprises an internal hollow cavity therefore aids to conveniently organise rooms shipshape by covering items placed on the floor or nesting the set together neatly in the corner of the living room, a highly appreciated feature trumpeted out through feedback, especially where room is rather limited. The table accommodates 41 litres / 10 Gallons of storage therefore occupies various items such as patio essentials – books & magazines – cushions, throws & towels – toys, games & tablets; it’s very versatile, however, take care with delicate possessions during rainfall, probably better sheltering the table inside, it’s light enough & easy to move. Cozy’s Urban set is adaptable to many uses and positions pretty much anywhere inside & outside. The modern artisan finish complements inside decors with tasteful authentic charm whilst outside their durable presentable styling enhances patios. From kids tea parties to positioned as a bistro set in a nook or alcove they’re perfect for alfresco drinks & snacking meanwhile located on urban balconies, porches, conservatories, summerhouses and inside living areas they provide a relaxing conversational seating set besides doubling-up as footstools. Below presents the dimensions of the ottomans / pouffes and storage table. There’s no installation required, simply unpack delivery for immediate use. On the whole, feedback adores Cozy’s cute looks, obtaining a plethora of 5 stars. The detailing of the knitted presentation & delicate colours harmonise with home-decors & furniture no matter whether situated indoors or outside. Their usage both in the home & outside seems 50/50 split reading through feedback. Occasionally however, I have come across the odd negative review with regards to damaged deliveries and manufacture-defaults. If you are unfortunate to receive anything below expectations, my advice is to contact Keter via their website or email if the seller is slow to reply. Alternatively, Keter can be contacted by phone, however, sometimes they take a while to respond. Explain what you purchased, who the seller was & what the problem is and let Keter explain the next steps to take for a replacement. 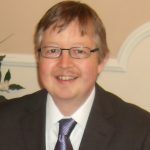 I have contacted Keter a few times whilst helping visitors, they respond fully supportive; usually within a day, once over a weekend. Keter’s Cool Bar, the perfect bar-height table-top addition to keep drinks chilled on the BBQ deck; great for outside parties & get-togethers. Hudson’s brushwood bench-seat, provides weather-resistant bench-seating with storage accommodation. Unravelling the knitted patterns of yesteryear followed by simulating the intricate weave in UV protected weatherproof resin, produced by cutting-edge molding techniques describes Keter’s pioneering innovation, no wonder they’ve patented this exquisite design. The versatility of lightweight & durable weather-resistant resin caters for use both inside & outside the home. They’re easy to locate, look adorable and prettily nest together meanwhile the craftsmanship produced & delicate colour schemes compliment indoors & outsides with nostalgic eye-appeal. 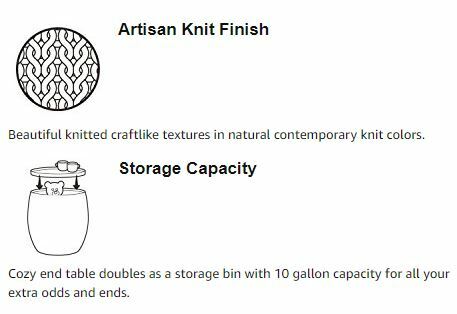 Reviving the memories of traditional knitting & reproduced in contemporary weatherproofed resin, Keter’s Cozy set receives remarkable feedback along with an inexpensive price; there’s no surprise for their growing popularity. 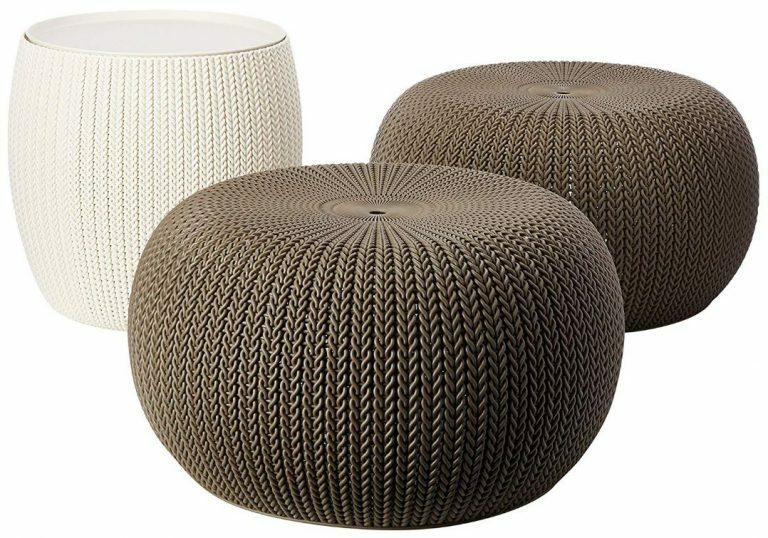 Hope Keter’s KNIT Cozy Urban Set provides plenty of inspiration & ideas with regards to your round outdoor ottomans search. Share your favourite weatherproofed pouffes & storage table below along with any related questions. Please share Keter’s KNIT Cozy Urban Set. Thank you. I have never seen these kinds of seats before and they look very interesting indeed! 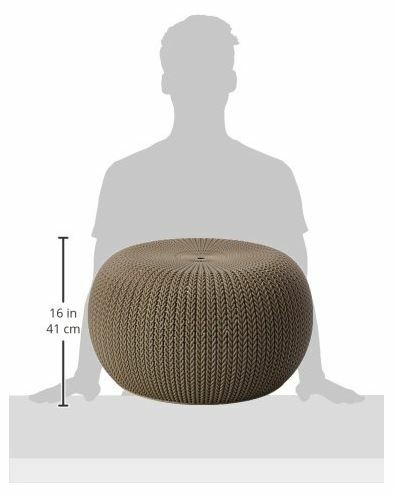 They got a bit of a ‘hip’ vibe to them as well and I do imagine a comfy sitting position in them, but with my back, I don’t know if they would do. STAIN RESISTANT! Well, that is definitely unique! I got a brand new soft comfy couhe that I am forever, already, finding stains to clean up. Too easy to wreck fabric furnitiure and always requires care. I checked out the prices as well and they are very affordable. Anyone thinking they aren’t haven’t seen the prices. If I had any doubts, the price certainly has swayed me. I am book marking your page here Simon, I really DO want to come back here and maybe treat myself and see how we go with it. If it suits, I may buy more. Thanks again Simon, on those unusual but very cool looking round outdoor ottomans seats. Hey Philip, thanks for stopping by to read about Keter’s round outdoor ottomans & storage table. I like the way the set nests together, they’re ideal for storing in small places like in the corner of a room or closet, they’re a lightweight handy piece of kit. 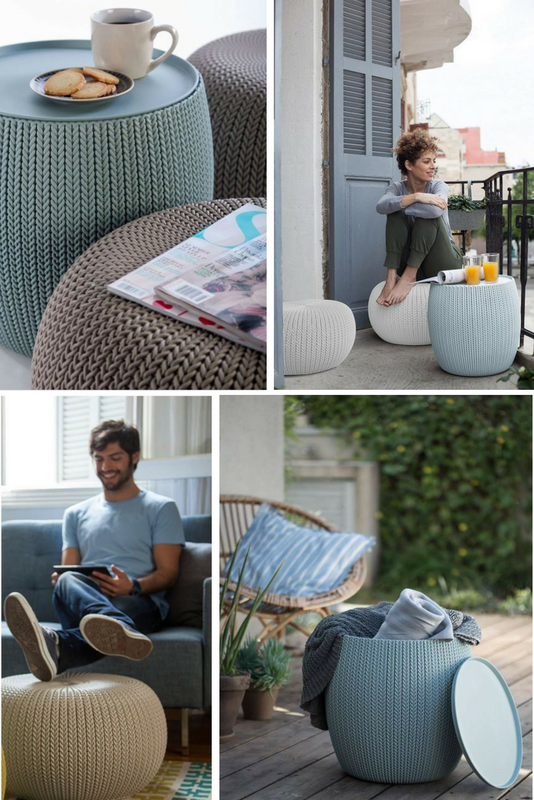 These pouffes can’t be described as to deliver pure comfort, rather, they provide a convenient solution for extra seating and footstool support in the home & outside, plus they’re ideal for patios and tight spaces, such as a narrow balcony meanwhile designed to resist changeable weather, from cold & damp to hot sunshine without any alteration to their resin-knit manufacture. Their delectable knitted pattern is what attracted my attention, it just shows how resin moulding innovation has evolved in recent years, this new engineering technique seems to be able to mimic all kinds of patterns and produce highly realistic wooden simulations boasting rot-resistant benefits. These are really cool concepts simon! 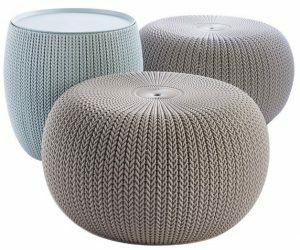 I can think of multiple uses for these ottomans both indoors and outdoors . We are deck dwellers in the summer and never have enough storage space. I sent my wife a text with the link. I think she will love the planter idea ! Hey Mike, thanks for dropping by to explore Keter’s KNIT ottomans & storage table. 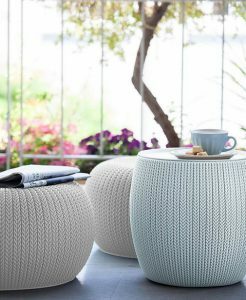 Their delectable knitted weave and neutral colours compliments indoors & outside spaces with aesthetic eye-appeal meanwhile their lightweight design delivers convenience in being able to move them around with ease, from the sitting room to outside on the balcony or patio. The way the set nests together attracts attention for tight spaces, they’re able to nest in a corner of a room or sun-porch meanwhile aptly stack together in a closet when not in use; a practical design that aids restricted rooms besides summer living. Like you, we love been outdoors during the summer. We’re always alfresco dining & barbecuing, the patio’s used as much as the sitting room during the summer months, only rainfall keeps us indoors. I keep getting messaged with regards to the planters, hanging baskets & pet beds, they look so cute and get plenty of admirable comments. 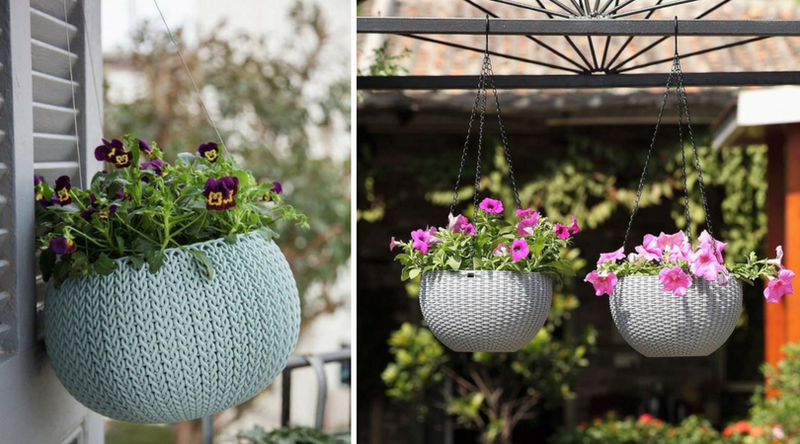 Hi Maryann, thanks for stopping by to inspect Keter’s KNIT collection, the flower planters are admirably designed to enhance porches & conservatories exhibiting their weave pattern. The pouffes do have a weight limit of 242 lbs / 17 stone therefore it’s best not to exceed the limit as the structure could crack. Initially we were on the lookout for some presentable footstools that could double-up for extra seating when the time came, like when friends visit & BBQ get-togethers etc. The stylish weatherproof weave is what captured our attention, meaning if rain showered down upon them, they would remain unaffected and not susceptible to rot. Produced with presentable styling also enables using the ottomans inside too with the addition of a storage table that helps organise bits & bats, keeping them handily within reach. We prefer sitting with our feet-up nowadays; heck, we must be getting older. What a well written and comprehensive post on Keter’s Cozy Urban Set. 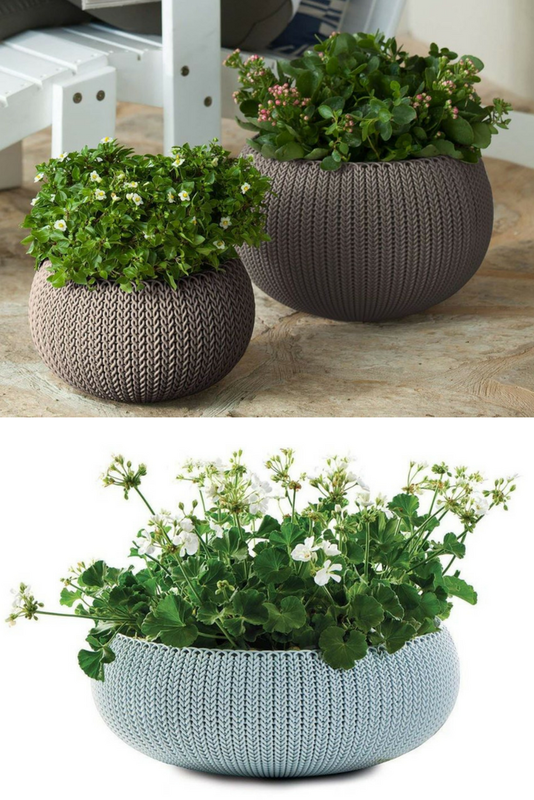 I would absolutely love the ottomans and hanging baskets for my outdoor patio. We spend a lot of time outside in the summer and I’ve been looking for some functional pieces. I’ll most definitely be checking these out. And the cat beds are awesome. Thank you! 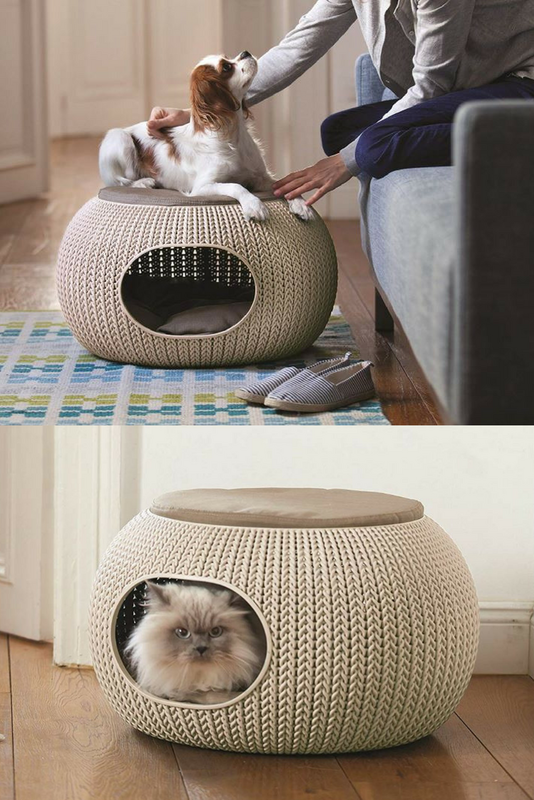 Hey Holly, thanks for visiting to read about Keter’s round KNIT ottomans and storage table, including the hanging baskets & cat beds; don’t they look cute. The way they have unravelled yesteryear’s weaving then re-created the same pattern using flexible weather-resistant resin represents groundbreaking innovation that requires cutting edge engineering to re-produce the knit. Similar to you, we spend most of our time sat outside during Summertime when the weather’s warm & fine, we’re always on the lookout for uniquely created functional pieces to enhance the patio. These styles certainly compliment indoor & outdoor spaces whilst their decay resistance becomes a blessing when left outside suffering the downpours. After reading feedback concerning rainfall seeping through the lid’s lip however, it’s best to move the storage table into a sheltered spot for protection if you’re storing fabrics & delicate accessories. Hey Aria, thanks for calling in to explore Cozy’s KNIT Urban Set. They’re a well thought out design the way they all neatly nest together, ideal for restricted spaces meanwhile their hollow structure covers items laid on the floor delivering organised convenience meanwhile light enough to move around in an instant as well as store away in the corner of a room or closet. Many people say there is a limit to where rainfall will enter inside the lid’s lip of the storage table, so having a lightweight design doesn’t really present any issues; it can be easily sheltered indoors if rain’s forecast. 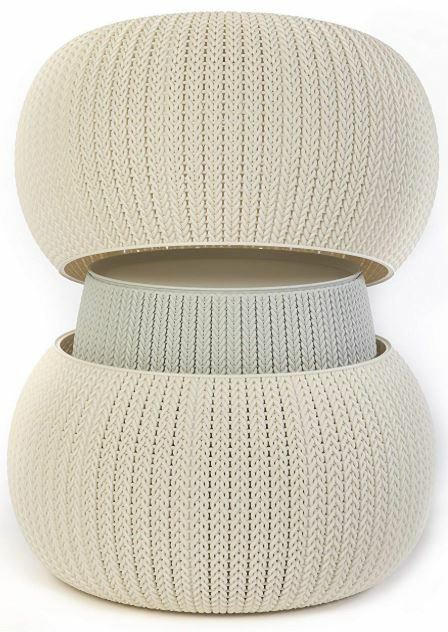 Like you, I enjoy the modernistic curvy, round & slightly concave design the pouffes flaunt, along with the resin weave they certainly attract admiration. Whether a cube shape is on Keter’s future agenda, I’m not sure. I have recently built a new wooden decking area out my back garden and have been looking for some quirky pieces of furniture to make the place feel more comfortable. 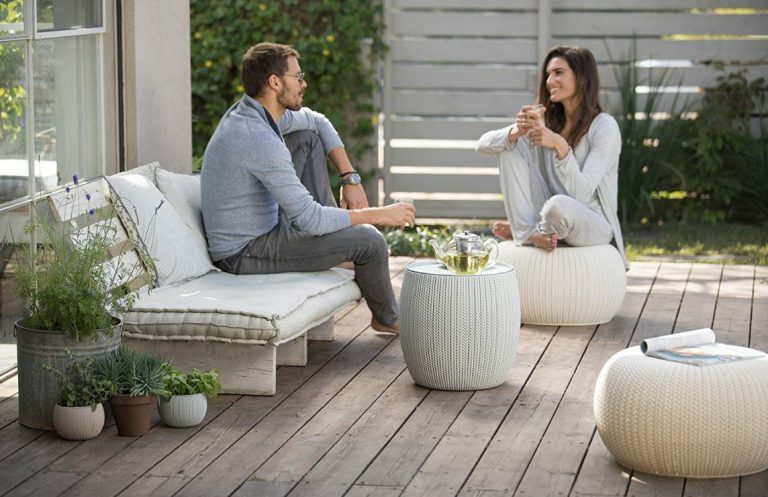 I love the style of the Keter knit cozy urban set and I think they would be ideal for on the new decking. How durable is it though? As I have 4 children, all boys and the youngest is 3 and im sure they will use it to jump off or fight with. Hi Matthew, Cozy’s elegant design showcasing the nostalgic knitted style certainly comes across quirky, many people adore the style, it seems to enhance any indoor/outdoor space, great for patios and light enough to move around. Friends of ours have just completed their patio, they’ve laid beautiful Yorkshire paving slabs throughout to attain a maintenance-free garden; like you they’re after some unique seating & furniture designs to complement their new surroundings. This knit style has also captivated their interest. They’re designed durable enough to cope with all-weather conditions without any structural alteration however they are only designed for sitting on (up to 17 stone) besides offering footstool support. They won’t survive jumping on, abuse or standing on, they will probably crack.